A small, humble, working class neighborhood in Ashdod along the Mediterranean Sea in Southern Israel I called home ever since I was in third grade. Ashdod was known to be the second largest seaport in Israel, after Haifa, with many white weeping broom** adorned sand dunes now gone, remains a distant, nostalgic memory of mine. The sea, a deep blue and glistening turquoise as ever, breathtaking as you drive, and it suddenly appears just around the bend, as you pass the mall, built over my childhood soft sand dunes. The sight of the Mediterranean appearing in its full splendor always makes me gasp in delightful surprise, the beauty indescribable. I am weary of the sea but awe inspired at its powerful beauty. A small grocer, in the middle of a rundown concrete strip of three stores, just steps away as we walk down from our second story apartment. A Moroccan synagogue nearby housed in a similar concrete structure, with worshippers putting on tefillin every morning and just before sundown. As I rushed every morning late to school, I stopped by the grocer to pick up a sufganiya, this one an Israeli doughnut, and shokko besakit, chocolate milk in a small plastic bag, in hopes that he didn’t run out. It was my breakfast growing up. Today a visit to Israel will never be complete if I don’t have my dose of Sufganiya and shokko in a bag at least once. Today a sufganiya every morning in Israel is hard to come by, but plenty around the holiday. Not only my favorite, the plain old classic filled with strawberry jam and sprinkled with powdered sugar, but many fancy ones filled with lychee and coconut creams, as bakeries mushroom all over and creativity is abundant. Laundry lines with clothes pins holding mismatched bed sheets wavering in the wind. If I look at a distance I see the same laundry lines drying not clothes but apricot color sheets of fruit. The Georgian neighbors had a specialty they introduced when they immigrated to Israel in the early 70’s, from the former Soviet Union, of fruit leather. Fruit leather drying on laundry lines was surreal just like the Indian Jews tropical coconut and mangoes were too exotic and foreign to Israeli palettes, but I favored the apricot leather over the other flavors, which my only Georgian friend brought to school as a mid-day snack. North African neighbors from Morocco, Algeria and Tunisia with multiple versions of couscous, Indians with our curries and every day rice, an Egyptian family quiet and private and the Georgians with their multiple fruit leathers. A melting pot of Jews lived mostly in harmony, with the once in awhile loud disputes, disagreement and rivalries. Often over minor mishaps like accidental dripping of murky water, from washing floors above the neighbor’s clean dry laundry downstairs. There was not much fusion of foods as we know it today but more of carrying on of each individual ethnic group’s kitchen traditions. 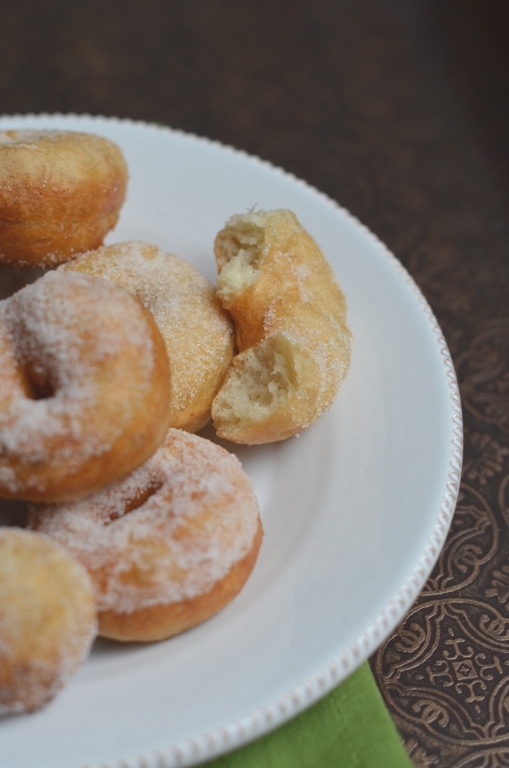 While my Moroccan friend was spending time at my mother’s kitchen learning the intricacies and art of making an excellent curried chicken, I learned from my friends how to make couscous and in turn sfinge, a Moroccan doughnut. 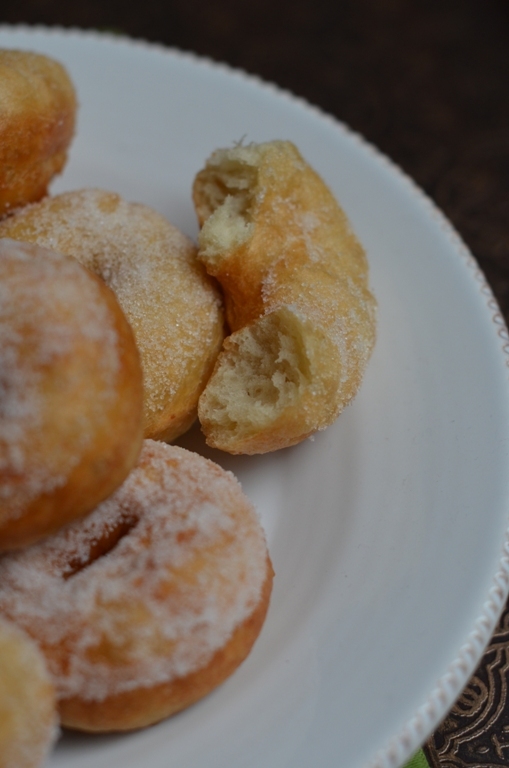 These doughnuts are egg and dairy free with large air bubbles, spongy yet slightly crispy outside. Add the flour, water, yeast, water and 2/3 cups of sugar to a mixer attached with a dough hook. Mix then add the salt and continue kneading with the dough hook for about five minutes. The dough will be very smooth but will appear wet, that is fine. Cover the bowl with plastic wrap and let rise in a warm environment for an hour or until dough doubles in volume. Since the dough is wet, deflate the dough and punch the bubbles out of the dough with a rubber spatula and let rise again, covered with plastic wrap, in a warm corner for an hour or until it doubles its volume. Heat up 1 1/2-2 inches deep oil in a large surface pot on medium heat. To test the temperature of the oil, put a small piece of dough in the oil and if it bubbles gently around the dough, then the temperature is perfect. If it bubbles to a golden/brown too quickly, turn down the heat to low. If it doesn’t bubble, let the oil heat up further on medium and test again. Take a golf size ball of dough and with slightly oiled fingers, invert it and pinch the seams and gently roll in between your palms into a smooth ball. At this point you can fry the doughnut balls to get small doughnut holes. This method is easy. Another method is to proceed to the next step. Make a hole in the middle of the ball with the index finger finger and expand the doughnut hole, while the index finger still inside and thumb outside, turning and stretching the doughnut in a circular motion in order to expand the hole. Work with both hands. Turn and expand gently until the doughnut hole is about 1 ¼ - 1 ½ inches in diameter (3-4 cm). Fry immediately for about two minutes on both sides until lightly golden. Drain on paper towel and dip in granulated sugar and serve warm immediately* (see cook’s note below). Sugar simple syrup: Make simple syrup. Heat up 1 cup sugar : 1 cup water on medium heat until sugar is dissolved. 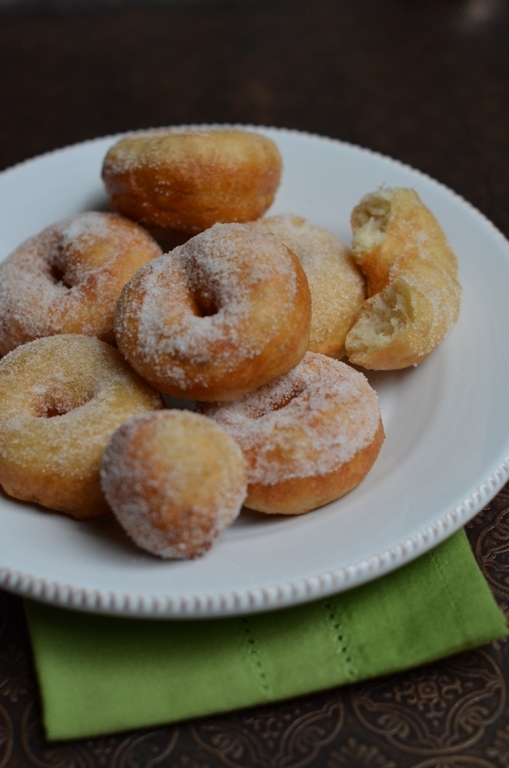 Dip doughnuts in simple syrup immediately after drained on paper towels and serve. After dipping in syrup you can also further dip into sugar and serve. Shh don't tell but you can also dip it in chocolate glaze. *Cook’s note: These doughnuts can be made at the most two hours in advance but would need to be reheated in the oven at 350F for 10 minutes. They are also fun to make on the spot as the guests are gathered around in the kitchen. **White Weeping Broom: Thank you Sarah @foodbridge for coming to my rescue in finding the name of this species in English. Nothing better than sfinge and a hot cup of Mint Tea in my world! I so love your storytelling and this has prompted me to get my Moroccan menorah pictures up soon! Love donuts! And yours look absolutely gorgeous momma! whoohoo for vegan donuts! do u think these can be baked? I'm so happy to be looking at these beautiful doughnuts. Love the simple syrup 'bath'. I just bookmarked them in two different folders. 'Spongy, yet slightly crispy' are the best words I've heard all day. I can probably eat the entire plate of these beautiful fluffy pillows called donuts. Lovely post and story ! And these lil' doughnuts are just amazing! The photos are terrific, resisting the urge to bite into the screen. Thanks for sharing another classic, Shulie! Shulie, between your blog and Sarah's at Foodbridge I crave Israel and want to rediscover her mystery, beauty and life again. What fabulous descriptions and memories. And donuts! Gorgeous, light and perfect! Do I dare try to make them? Well written post. I enjoyed reading it and yes, the donuts looks perfect. Extremely tempting and so delicious looking! What a wonderful post taking me right to the heart of of your memories Shulie. Love these doughnuts - food memories are always the yummiest! what great post and recipe! Wants me to make one right away! I wish I had one of these doughnuts right now. They sound so light and delicate! Thank you for sharing your memories from years ago. It's always interesting to read how lives differ from our own. What a wonderful post..memories..great food...and lovely write up! These look great and how awesome that they just so happen to be vegan! I was struck by your comment that even though this was a daily treat during childhood, that a visit home required that they be had at least once. I think we must all have those memories. They sound perfect; light and simple. My kind of doughnut. Very delicious look doughnuts! Love the history and story as well! A wonderful story, and the doughnuts look light and yummy! Shulie .. so many memories! This post is so beautifully written .. you took me there.. you did! They are beautiful, Shulie! I was reading about Israel's neighborhoods yesterday and I know someday soon, I will go. Your writing makes a clear visual picture of your childhood memories. It's a pleasure to read! I'm bookmarking this recipe for Chanukkah. Chag sameach! I always enjoy reading about your childhood and the way you describe it really takes me there. Love these! You're such a fantastic story teller :) Love hearing about where you grew up. And these donuts - yum!! Shulie, i love reading the stories about your childhood; i can picture you in the grocery store to pick out your doughnut and chocolate milk . . . sigh . .. Thank you so much everyone for your kind words. I love my childhood sand dunes:) Junia, I have never tried to bake these, but when I tried with the more mainstream doughnuts they were successful though to me tasted more like baked mini bread loaves, you just don't get the same sensation. Folks, I hope to post a step by step to this recipe towards the end of the year. Once you get the rhythm of forming one you get the hang of it. 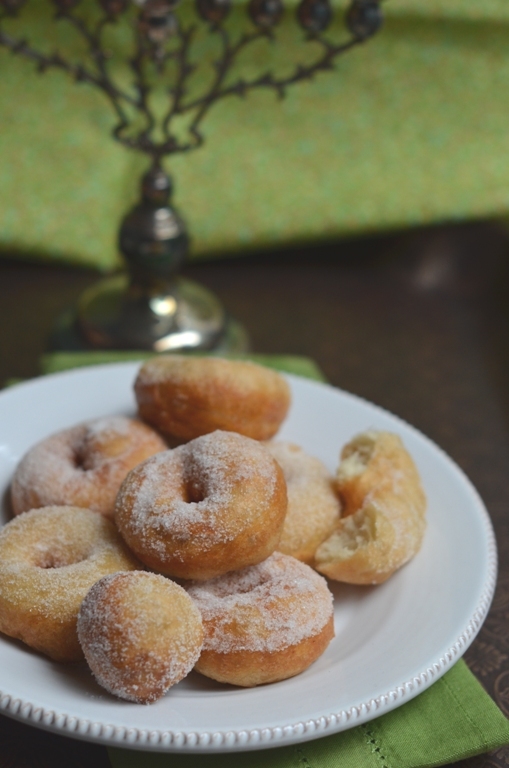 Beautiful food memories :) I usually don't eat doughnuts, but I love that these are so simple and light - and vegan! I always love reading about your Israeli childhood. You have a way of story-telling, takes me right there with you. These doughnuts sound like the perfect breakfast. You have no idea how badly I've been craving donuts lately. These look fantastic Shulie. I want them....badly! :) Gorgeous! God these doughnuts look so delicious!!!! I love love love doughnuts and the texture of these looks amazing!! Plus, I love the story and memories behind them. Such beautiful food memories, Shulie. 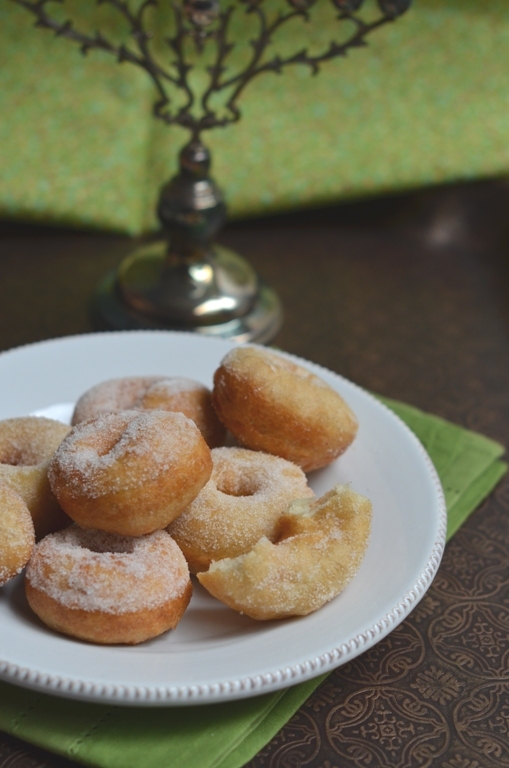 Love the doughnuts with a dollop of strawberry jam and a dusting of sugar. I can taste the fruit and the sweet grit from the sugar. And thank you, Shulie for the thoughtful note and tweet about my ginataan post. Much appreciated. How would I resist the temptation Shulie? This Doughnuts look so delicious! What a beautiful post Shilie, both in words and pictures. Your words took me to your hometown... and learned a bit of your history... and these doughnuts... yum reminds me of our local doughnuts too. I love it when it's hot and fresh from the oven... and granules of sugar is all over your mouth, hands down to your chest haha. weekend is here... have fun! I missed out on these gorgeous fluffy beauties..busy with Diwali preps. And what a wonderful read it is, Shulie. What a great story, and great childhood memories! These doughnuts look fabulous too! My in-laws return this week from a Mediterranean cruise and I believe one of the first stops was in Ashdod. Looking forward to hearing about their trip and seeing the photos! The donuts look awesome! so tempting! I am trying to make these. Some how I do not get a good dough. I tried to convert 2.2lbs to ounces to see how many cups of flour. I added 4 cups all purpose flour, 1 oz yeast, 2/3 cups sugar and some salt. My dough was a goey mess with just 2 cups water..... and i had to add more flour to get some consistency. I would love to make these (cant eat donuts outside as they contain eggs :( ).... can you pl help me the measurements? Aww Deeptie, no wonder, 1 kg/2.2 lbs is about 7 cups flour. It would be a gooey mess with only 4 cups. The dough will still be wet at the measurements I am giving but just wet you fingertips with a bit of oil and make the doughnut holes they are simpler to make. You can try your hand at the doughnut with the hole in the middle but after the shaping the first one you will get the hang of the rhythm to shaping them. Looks amazing!!! I was looking for a donut recipe that was vegan friendly.